At the beginning of July 2018, a regional presentation of the “Education for Employment in Macedonia“ Project was held in Strumica, in order to present the upcoming project activities. The event was attended by representatives of the local self-government, the business sector and the schools. During the welcoming address, the mayor of the Municipality of Strumica, Kosta Janevski pointed out that the local-self-government will support the activities that will be implemented at local level. “I am very happy that the Municipality of Strumica has continuity in terms of the work on projects. I believe that the reason for that is the atmosphere and the conditions present at local level. 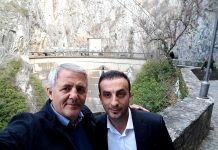 What gives me special hope and satisfaction is the fact that this is a long-term project which will yield good results, and the Municipality of Strumica is here to support all the activities and give its contribution to the activities”, added Janevski. The Team Leader of the Project, Kurt Wüthrich emphasized that the purpose of this Project is not to copy the Swiss model in Macedonia, but, by adjusting certain elements of the Swiss system suitable for that purpose, to develop a special system for development of vocational skills that will be typical for Macedonia. “During our work, we will focus on two clusters that incorporate different economic sectors. The first one is the cluster of technology and production that incorporates the vocations and skills in the area of agriculture, food technology and machine engineering, whereas the second one is the service cluster that includes tourism, with a special accent on hospitality, personal services and health and social services”, said Wüthrich. Taking into consideration the importance of the quality of the vocational secondary education and the positive effects it has on the development of the economy, the Economic Chamber of Macedonia and the other state institutions on the one hand, and the private sector on the other, take active participation in terms of the implementation of the national educational strategies which will be felt on the market on the medium and long run. Speaking of the key importance of the partnership between the vocational schools and the private sector for the ensuring that the young people will acquire the skills that are required by the employers and that will help them to get an employment more easily, Branko Aleksovski, advisor in the Vocational Education and Training Center pointed out that the involvement of the private sector is essential for this Project. “The skills of the students will be improved if we provide practical training in real work situations in the companies. The cooperation of the educational institutions with the companies is crucial“, added Aleksovski. In the following 10 years, the project will be implemented by Helvetas Macedonia, the Macedonian Civic Education Center and the Economic Chamber of Macedonia and its purpose will be to enable as many citizens, especially young people, to acquire high quality vocational education and skills, as well as to help in the development of the vocational skills that will contribute to the increased employment in the country. In the first four years of the project’s implementation, it is expected that 2,250 pesons, most of them young people, will be employed due to the improved vocational skills. 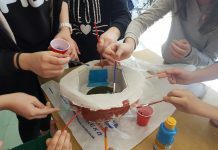 This activity is part of the Education for Employment in Macedonia (E4E@mk) Project, funded by the Swiss Agency for Development and Cooperation (SDC).